Warning – this piece may contain spoilers. If you’ve not seen Interstellar, you may want to skip this and read about something else instead. This post may also contain random links / segues. Hans Zimmer’s soundtrack for the film Interstellar contains passages played on the four register Harrison & Harrison in the Temple Church in London. This 1927** pipe organ, installed in 1954, adds a certain resonance to the music that only an instrument of this kind is able to provide – and, perhaps, only organist Roger Sayer was able to produce. Interstellar is, of course, a film about time travel, a subject that rarely gets discussed in horological circles (in fact, I couldn’t find any mention of it at all in my copies of Daniels, Saunier, et al). While #watchnerds and #clocknerds focus on high precision timekeeping, filmmakers are able to play a little looser with the fabric of space (and time). It’s no surprise, therefore, that Zimmer’s soundtrack leverages Christopher Nolan’s mangling of the laws of physics, using metronomic rhythms and even tick-tock-like beats to drive the story forward. In the track Mountains, which accompanies the visit to Miller’s watery planet, each of these metronomic ticks is strangely delayed. Miller’s planet is, we’re told, so close to the black hole that relative time has been slowed down, so that one hour on the planet’s surface equates to approximately seven years on Earth. Measuring the speed of the opening minute, I was surprised to see that it’s a fairly constant 48 bpm. Assuming that this was deliberate, then each “tick” on the track (assuming you’re listening on the surface of Miller’s planet) is equivalent to approximately 77,000 ticks (i.e. seconds) on Earth, or possibly the orbiting Endurance. I’d expected the number to come out closer to the former, but it only equates to c21 Earth hours. Perhaps it’s Romilly’s time that we’re actually hearing tick away? Of course, we (perhaps unknowingly) witness gravitational time dilation every day. Orbiting GPS satellites perceive time slightly faster than we do, and their signals are, in fact, slowed down by approximately 38 milliseconds per day***. When Tim Peake returns to Earth having completed his Principia mission – assuming that his watch has kept reasonable time – it should have gained about seven seconds (I may be entirely wrong about this). But this isn’t the only example of relative timekeeping. The Japanese started using relative time in the Edo Period. The day began at sunrise, with this time being designated six o’clock, and ended at sunset (also called six o’clock). As the length of time between these two points changes day to day, and the Japanese were only able to use clocks with regular timekeeping, they needed a slightly more fluid way to measure time – the temporal hour system (和時計 or wadokei). The video above illustrates the wadokei principles as applied to the dial of a wristwatch. Masahiro Kikuno, an AHCI member, produced the first automatic^^ wadokei ever made which he showed at BaselWorld 2011. Last year he updated the watch, releasing the Wadokei Revision. As the days advance the two characters representing dawn and dusk move to reflect the changing length of day; I particularly like the new oxidised bronze case, which reminds me Japanese lantern clocks. It’s a glorious complication (although not one that comes at a particularly affordable price) and, due to the complexity and effort involved, is limited to a single piece per year. Kikuno’s wadokei watch is, in fact, a modern version of a very traditional, although quite rare version of traditional timekeeper: the inrō dokei. Because traditional Japanese garments do not contain pockets, a small box or inrō was attached to the belt (often using a netsuke and held together with an ojime). The box was usually for medicine or seals, but could also carry a small clock. These small, handheld devices are incredibly rare, is seems, and highly collectable. The mechanism for adjusting the hours is similar to Kikuno’s Wadokei Revision watch, but must be done by hand. Last December I was invited to a private showing of the Bonhams Clocks and Watches Sale by the Antiquarian Horological Society. 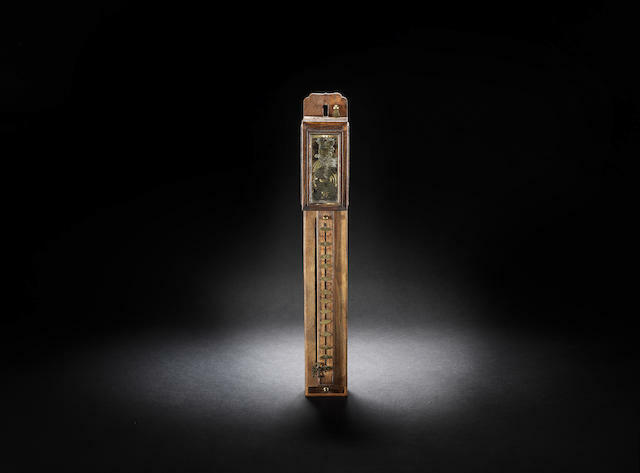 I hadn’t realised until it was mentioned by James Stratton that Bonhams is the only international auction house to have sales devoted entirely to clocks. In it was a series of Japanese clocks; one, a shaku dokei or pillar clock,caught my eye. It uses a simple foliot escapement and a series of movable hour markers that are arranged vertically. As in Kikuno’s wadokei, the intervals can be lengthened or shortened by sliding them up or down the case. A falling bob indicates time with a butterfly or other, slightly whimsical marker. Each morning, the pendulum is reset, and the bob begins its journey again. The hour markers themselves need to be adjusted every fifteen days or so; after that, the time dilation becomes too apparent. Other versions of the shaku dokei clocks strike on the hour / half hour, using the weight of the bob hitting a bell attached to each marker. I remain on the lookout for one of these latter clocks: it tickles the #clocknerd in me, and reminds me that all this is relative. Probably. Disclosure: I was a guest of the AHS and Bonhams in December 2015, during which canapés and alcohol were served; a copy of the catalogue, as well as AHS ephemera, was included in a gift bag; I remain a founding member of the AHS’ Wrist Watch Group.